♪【EXCELLENT SOUND QUALITY】Wireless karaoke microphone with adjustable powerful echo effect, the 3D texture metal net guard and built-in high quality sponge filter can out airflow noise and wind noise effectively. Bring you clear and stereo sound. ♪【3 In 1 Function】♫SINGING AT ANYTIME ANYWHERE: The wireless karaoke microphone with sensitive microphone, just turn on and adjust the volume and echo, then ready to sing. ♫ BLUETOOTH SPEAKER: Bluetooth karaoke microphone with loudspeaker cavity structure to deliver loud and clear sound.♫ RECORDING YOUR SONG: The bluetooth karaoke microphone can record songs when bluetooth connected or you can also use the included audio cable to record your voice. ♪【HIGH COMPATIBILITY】The Speaker also can Play your Music from the TF Card (Not Included) with MP3 format. It is Light weight, Portable, Handheld, a 3+ years old can easily hold it and sing without the need to keep it hooked anywhere. ♪【COLORFUL LED LIGHT】 The LED light with 6 different color will shine along with the music rhythm changes, switch by the power button, the lights will create a perfect atmosphere as same as KTV. 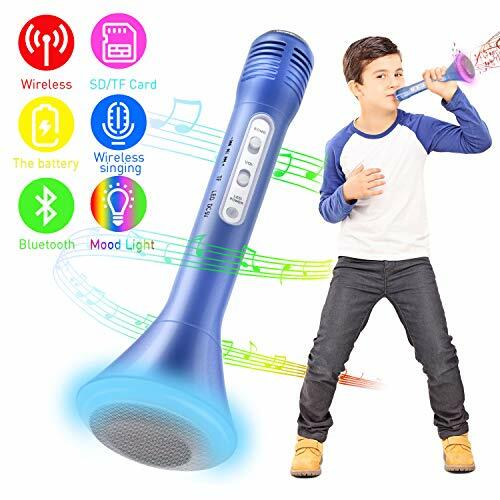 ♪【BEST Gift for Your Kids】The kids karaoke microphone is mini size, light-weight and easy to hold. Wireless karaoke microphone is a creative gift for birthday party, family karaoke, which makes us sing anywhere and anytime leisurely. It\'s perfect for gatherings or Home KTV. What\'s more, It\'s work Independently without extra connection, can sing for 4-5 hrs with safe rechargeable battery.